First Churches of Northampton is located at 129 Main Street in Northampton, Massachusetts. You can use Google Maps for directions. Street parking is available in the area around the church. 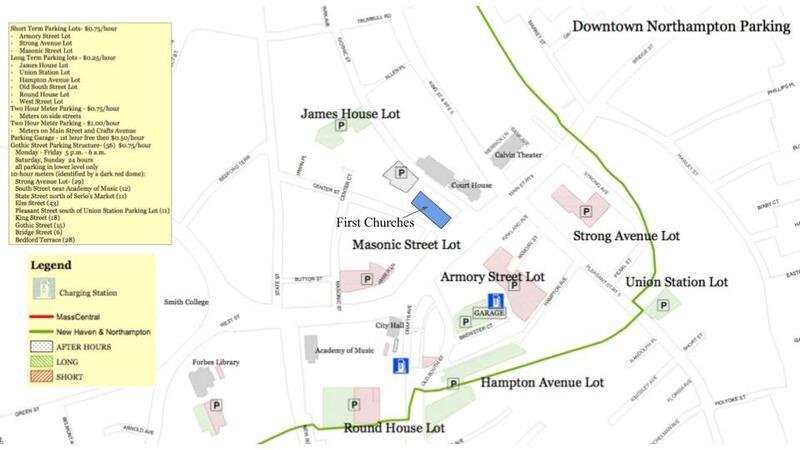 In addition, there are several city parking lots close to the church (see map below). The closest are the Gothic St Garage ($0.75/hr; open after 5pm weekdays, and open 24 hrs on weekends), and the Masonic St and James House lots ($0.25 – $0.75/hr, free after 6pm and on Sundays). Our Center Street entrance is accessible, and all parts of our church are as well, via our elevator. Visit PVTA.com for bus information.